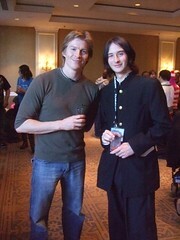 While eating shish kabobs and baklava, I got a call from Aya, a Fanime guest relations staff. So I guess there was an "emergency" and they needed an interpreter for the Q&A panel for LMC, one of the musical guests. It was from 11am to 12pm, which is right smack in the middle of the day. But since H also had some work to do (he's a workaholic, just like me! ), we decided our plans could be pushed to later in the day. So I said I could do it. So on Monday I show up for a brief meeting with the LMC people (LMC and their international relations manager). but it seemed like I was called to troubleshoot and fix some issues. We figured out how the panel was going to go, asked them their concerns, and etc. I was a little nervous if I could satisfy the needs of the LMC people, but I guess that was good. I was so sleepy, but I got the adrenaline to kick in. I went to the panel room on my own to set up the seats and stuff. 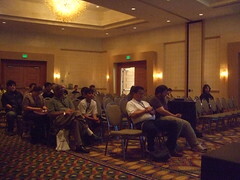 I was actually greeted by the con chair in front of the panel room, to thank me for doing this. So I go into the room, filled mostly with cute, young girls. As I was setting up the chairs and microphones, they scream. "What animal would you choose to be?" "What was the weirdest thing thrown on stage?" (A person came on stage in Paris and hugged and kissed one of the members...and it was a guy). "What were your first kisses like?" 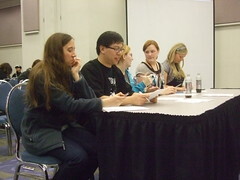 In the end, the panel was a HUGE success. Both the LMC entourage and Fanime were happy. And most importantly, the fans were happy. I don't have pictures of all of this because it was so tense. I'm glad I got to meet the other staff members of Fanime outside the GR. They all came to thank me! And gave me stuff. That was nice of them. 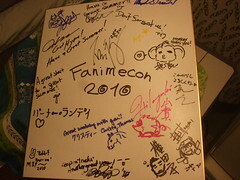 This is my shikishi for Fanime 2010. I got about 5 hours of sleep, which is very little considering that I sleep 7 hours at night and 1-2 hours (sometimes 3) during the day. Yet I pulled myself out of bed and got ready to go to Fanime as I listened to the repeated news of the perfect game pulled off by the Phillys. I went to the green room hoping to eat breakfast there. I managed to grab half a croissantwich as the staff were cleaning up. Unhealthy, but it was goood. I spoke with Yamaga-san regarding his schedule. He was supposed to have two interviews, but one of them canceled. So we sat around for a while. Former guest relations chair Aya came with her dogs and we chatted a bit. Then I left to go to Yokota-san's "Drawing Panel." (There's an actual name for it, but I call it this. I previously translated a similar panel for Takamura-san, the character designer at GAINAX). This panel is pretty cool because an artist draws on a paper on the overhead projector while he talks about the process. In Yokota-san's case, he just took questions as he drew. This was a really efficient thing because he understood the time lag with the interpretation. 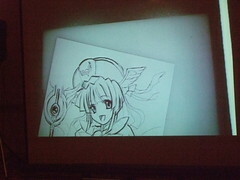 Yokota-san took requests for what to draw, and a young man asked for a "magical girl." I was like, "Like Sakura the Card Captor?" The panel wasn't as full as I thought it would be. 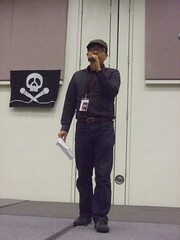 It's too bad, because Yokota-san is a really good panelist and very talented. You'll notice Yamaga-san is there in the front row. He was there for mental support. Okay, so here I say Yokota-san is a great panelist because he pauses after a phrase/sentence so it's really easy to translate. But other than that, he is entertaining and funny. So if he comes back to the US, I recommend you go to his panels. 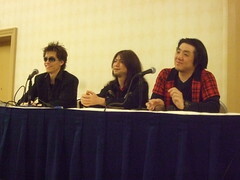 After this panel, I went to go join Yamaga-san's interview with Anime News Network. I didn't interpret, but the interviewer is one of my favorites and asks very good questions, so I listened in. After the interview the three of us (Yamaga-san, interpreter K, and I) went to La Victoria's to get lunch. Then we headed to Fairmont for the annual Yamaga Party. There were actually enough interpreters for each Japanese guest, so I got to roam around this year. I first interpreted something for Mori-san. 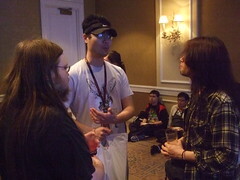 The guy was showing a button he got at the artist's alley that had a BlazBlue character. And then said the price. (I think $1.50). And that there were probably more available at the booth. So I was telling Mori-san, in Japanese, "Um, I guess he's suggesting that you go buy the buttons." He totally laughed about it. So in general, it seemed that everyone had a good time. I stayed outside the room most of the time because the "walla" was hurting my ears a bit. I asked Ishiwatari-san as a composer (as they have good hearing) if it bothers him. He said he has the mute function in his ear. (Maybe he was talking about the hair that covers his ears). 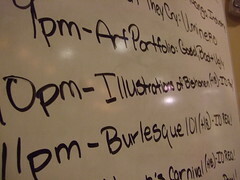 The party was officially my last "job" at Fanime 2010. So I said my goodbyes to all of the people I worked with and headed out. ...To the Left 4 Dead 2 tournament! It was a smaller group of people compared to last year. Is it not as popular? Or was it the time slot? Anyway, I took some pictures and watched a few battles. It's so fun watching the audience reaction, like when a tank kills off the survivors. I said goodbye to Fanime until next year and headed over to H's house, my best friend from high school who moved up north when he got a job at very popular Company A in Cupertino. Until during dinner, I got a call from Aya. 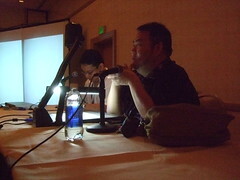 Today I started off the morning with the "History of GAINAX" panel, which I didn't translate. I did help a little in the beginning to set up. I've heard the beginning of GAINAX story many times (and interpreted it a few times) but I really like the response the fans give when they hear it. I had to leave after an hour because my other client, Company A, was having a panel. They rushed through the announcements and I didn't catch any of their upcoming releases! But I guess they wanted to give more time for the Q&A? Mikey is the guy in charge of localization for BlazBlue. I translated Theresia with him a few years ago. The Aksys panel, after the hour, just merged with the BlazBlue panel. (or understand them) but someone asked why the game was geared toward newbies. After hearing that, I think I could try playing it. 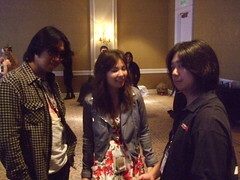 Afterward I asked Mori-san about it, and I think I'll play it on the Xbox. Mori-san also plays on the Xbox. (He plays it on PS3 too, but he recommended Xbox for the online community). I was starting to get hungry during the panel, so after it finished I immediately met up with my friend B, who just came out of the Dark Horse panel, to go get lunch. He told me great stories about Dark Horse, so please check it out on MangaCast when it goes up. After lunch, I went to interpret for Yamaga-san. He had an interview with press. They had a nice set-up, like a portable recording studio, that Yamaga-san was intrigued with. We went back to the green room to sing some karaoke, and then I parted ways to meet up with my industry friends F and B to go to the "Intern in the Manga Industry" panel. Both F and B are successful graphic designers who have interned in the industry before, so we just wanted to check it out. TokyoPop, unknown, and TokyoPop from left to right. I really wish they had a graphic designer person too, since I'm sure a lot of fans are interested in working in that department. 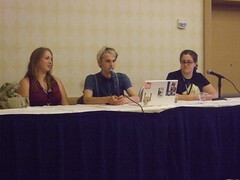 So panelists, if you're reading this, please invite either F or B to this panel next year! 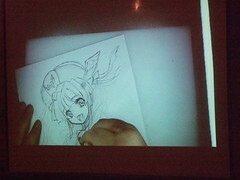 We then went to dinner, and then went to Yokota-san's "Illustrating Bishoujo" panel (18+ only). 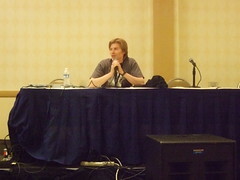 I couldn't take any more pictures because I was helping out with the panel. It was pretty unfortunate that we couldn't show the pictures Yokota-san brought on his iPhone to the crowd. I stayed with Yokota-san to help him with other business that I can't talk about publicly, while F and B went home. 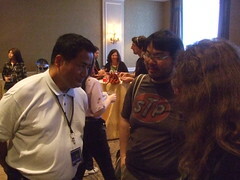 Yokota-san even obliged to an interview at 12am, which is REALLY NICE of him. We then went out to get junkie food (I didn't get anything). I got home (my room) past 2am. 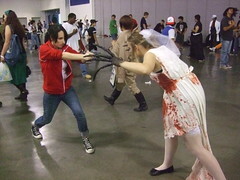 Today my Fanime started in the evening. I first went to the Green Room to see if Yamaga-san had arrived. He was, and gave me my omiyage from S-san! For some reason I always ask her to bring me manga. After talking to Yamaga-san and fellow GR staff K, I headed to Marriott for the Capcom & Motion Capture panel, hosted by my friend Reuben. He had a special guest jump in, Karen Dyer. 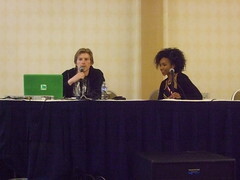 She did the voice and motion capture for the woman in Resident Evil 5. I tried playing that game, but it was very difficult. "Push this button to get your gun out, then push this button to shoot." I left a bit after this because my friend B came, so we went around the dealer's room. I went looking for my clients and friends...and found Company A! 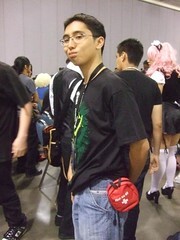 And a fellow translator who works there was cosplaying! I asked if he bought the costume from Cospa, but he said his mom made it. What a nice mom!! And it was very well made. My other friend F texted me that she arrived as the dealer's room closed, so we met up with her to go to the karaoke contest, because F's friend was performing. Unfortunately, we missed that performance, so we went to eat. We then went back to the finals of the karaoke round. This was the guy in charge of karaoke. The flag in the back is cute! The winner got a black Wii! (Sorry, I forgot to take a picture). Tomorrow will be a busier day. So I was watching it rain in Roland Garros on TV, waiting for the French Open to start up again when I got an international phone call. It was S-san, a producer for Company G.
Last night, there was a problem with Yamaga-san's flight (some airplane problem??) 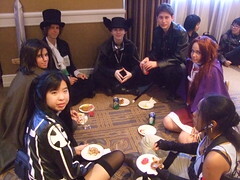 and it was canceled, so the poor Fanime green room staff had to scramble to do something about it. To tie up loose ends, S-san asked me to step in to figure something out. After a few phone calls and a long Skype chat with S-san, we figured it out. We both talked that we were lucky that this year it was only Yamaga-san, and also that Yamaga-san is so flexible. It's nice to have a chilled out boss like that. I'm all packed up (except for my laptop) and I'll be heading out in a few hours. and all the fans of my industry. 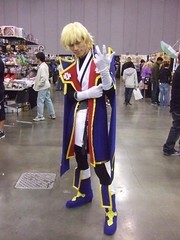 Again, I'll be taking pictures of cosplayers related to my work (lately it's mostly been Shugo Chara). I had to finish Shugo Chara #10 in a week, but I pulled it off! I can't really talk about it because there's a bunch of spoilers, but here are some terms to describe what happens. Now I can focus on getting ready for my trip to San Jose! 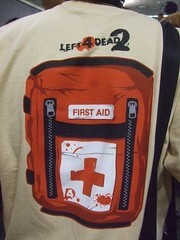 And it looks like there is a Left 4 Dead 2 tournament-like thing going on, so I will be there! I have to rush back from the Yamaga party though...in heels. Currently I'm working on three projects. This is what I call "feast time." and I'll be starting work on Shugo Chara #10 this weekend. I'm also preparing my trip to Fanime. I'm not going to "work" as usual. At Fanime, I hope to touch base with a few of my existing clients. I'll be going on Saturday and Sunday. 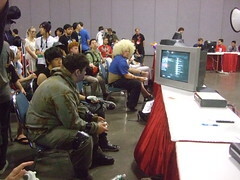 Of course, I will be checking out the Left 4 Dead 2 tournament to recruit online friends. If anyone else is going, I hope to see you there!